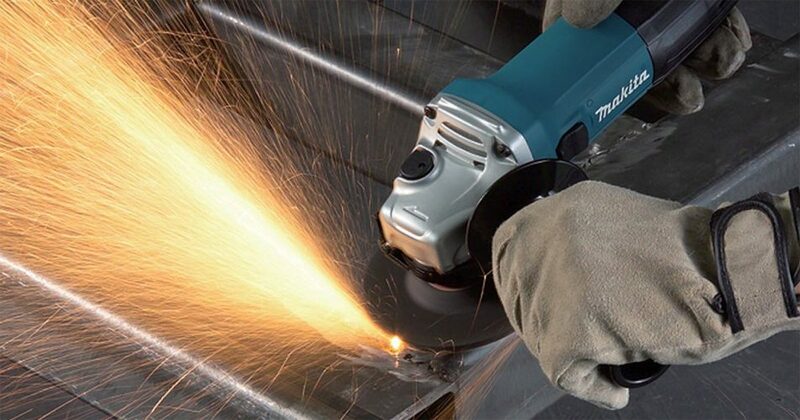 To know what you can optimize your use of your angle grinder, you have to know the ways in which you can use it. Angle grinders come various shapes and sizes but the most common are the 4-inch and 4.5-inch ones. Their motor power also varies, and the heavier the work duty, the more amps the motor should draw. First and foremost, you should pick the kind of wheel that is designed for the task you’re looking to do. You can use your angle grinder to clean metal, cut bars, rods, bolts, tiles, stone, and concrete. In addition, you can restore cutting edges with your angle grinder and cut out old mortar. Read more: 8 Best Angle Grinders You Can Buy Right Now. What are Angle Grinders Used For ? You should mount a metal cutoff wheel in your angle grinder. It’s generally inexpensive and does well when it comes to cutting rough metals. You should prop up the long side of the rebar and make sure it’s securely held. Then, you drop the cutoff wheel through the metal, using the weight of the grinder to exert the effort. Finally, the short end should be left to drop freely so that you don’t bind the blade. With patience, you can cut pretty much any kind of metal. You should begin by marking the outline of the cut accurately on both the front and the back of the tile. Securely position the tile, then score the outline about 1/8-inches deep on the front using a diamond blade. Next, you flip the tile over and cut it from the back. If you want perfectly square corners, you should slightly extend the cuts past the lines. You should use a wire brush to clean larger, flat areas. If you want to clean in between tighter spaces, you should go for a wire wheel. To clean rust, cement, and dirt from your metal tools you should secure the thing you’re working on with clamps or a vise. As you work, make sure that the brush is spinning away from the edge and not into it. Otherwise, the grinder might kick back due to the brush catching on the edge. Depending on the stripping, cleaning, or deburring task you’re doing, your choice of a wire wheel and brush attachments. You should clamp the blade in a vise or to a workbench. Direct the grinder and adjust the blade guard to deflect the sparks from your body and face. Make sure the grinding wheel is aligned with the angle on the blade. Finally, start the grinder and move the wheel steadily across the blade as you apply some light pressure. You should make sure that you’re stroking the grinder across your work in the direction of the handle and not grinding back and forth. If you overheat your metals, they turn a bluish black color and don’t stay sharp long after. To avoid that, only apply light pressure and keep the grinder in motion. You can even keep a bucket of water and a sponge nearby to cool your metal down manually every now and then. An angle grinder and a diamond tuckpointing wheel are the 2 things you need to grind old and loose mortar. You should make a few half-inch deep passes to clear the joint and stay around 1/8 inches away from the brick lest you damage it. Now, these are just a couple of things you can use your grinder for. There are so many ways you can make use of your grinder, so don’t hesitate to ask a local hardware store or home center. How to Use an Angle Grinder Safely? The fact that grinder spin at around 10 thousand RPMs (rotations per minute) should make you feel the need to take some safety measures as you work with your grinder. Firstly, you should wear a face shield and gloves. Whenever you’re changing wheels, make sure you unplug the grinder. Always wrap your hands around the handle tightly with a firm grip. If it’s available, use the guard. Test new wheels for any defects in a protected area before you start working with them. Make sure the debris is directed downward. Always make sure the piece you’re working on is securely held on a vise or workbench.